Breaking Ground on the Garden! Earth Day Work Day is April 21st!! Put on your work gloves, we're building the garden!! 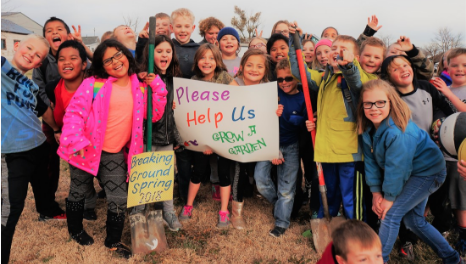 Everyone is invited to join the fun and make a difference on April 21, 2018 from 1:00 to 4:00 p.m. Our plans for the garden include 36 raised beds for vegetables, this will give each and every student 1/4 of a garden bed to plan, care for and harvest any vegetables they want. Border beds of native plants, grasses and berry bushes and a bird habitat will give students the opportunity to expand their Ornithology unit (study of birds) and allow students to see and perhaps use some of the native plants just as settlers did on the Oregon Trail. ​We've had great help with this project! Thank you: Cornell Lab of Ornithology, Bomgaars, Beyond School Bells and the Afterschool Program, Black Hills Parks and Forests Service Association, CSC, UCC Women's Group and SeedMoney. The garden will serve as a citizen science lab where students will learn hands on about the life cycle of a seed, understand how an ecosystem takes all kinds of creature to thrive, and make the connection between earth, soil, and their health. Students will even have an opportunity to monitor blue bird boxes. Teachers will integrate lessons in math, science, nutrition, and art.If you'd like to be involved in the build or volunteer in the garden please contact Jacki at [email protected]. It will take a small army of volunteers to build and maintain the project but we believe it is well worth the time!